Moist to moderate moisture. Woods, forests, thickets. Full or partial shade. This is a 4″ to 8″ tall, delicate, erect perennial rising on a hairless stem from a slender, horizontal rhizome. The rhizomes grow quickly and the plant is often found carpeting large areas. A sterile individual and a flowering individual may be produced from the same rhizome. A sterile individual is a solitary basal leaf at the top of a long leaf stalk rising from the ground. It is divided into 3 to 5 irregular leaflets that are deeply notched and unevenly toothed above the middle. 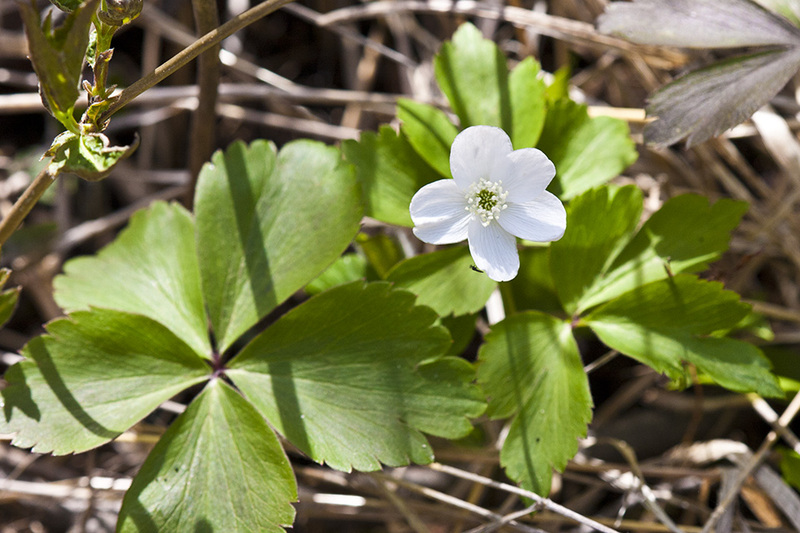 The flowering individual is an unbranched, erect stem topped by a whorl of 3 leaves and a single flower stem. The stem below the whorl of leaves is hairless. 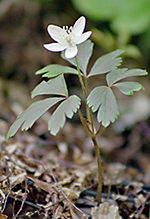 The stem leaves are similar to the basal leaf only smaller. The leaflets are roughly lance-shaped, widest above the middle, and taper to a wedge-shaped base. 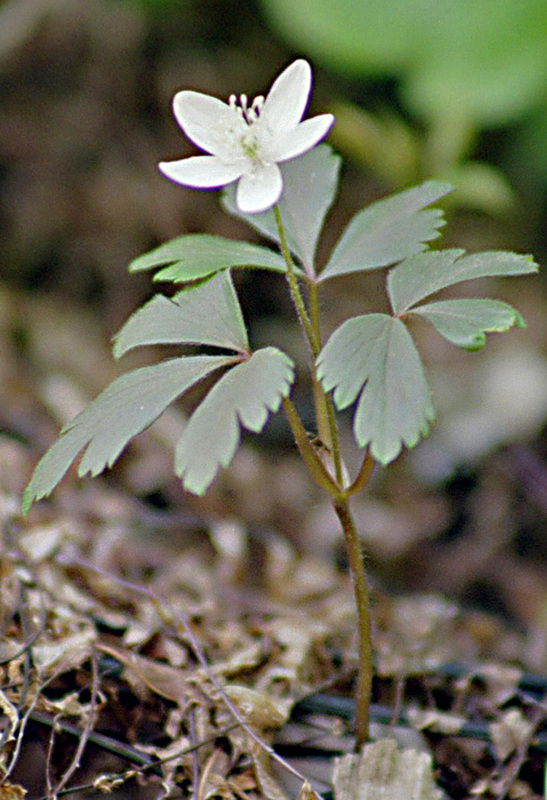 The flower stem (the stem above the whorl of leaves) is unbranched. 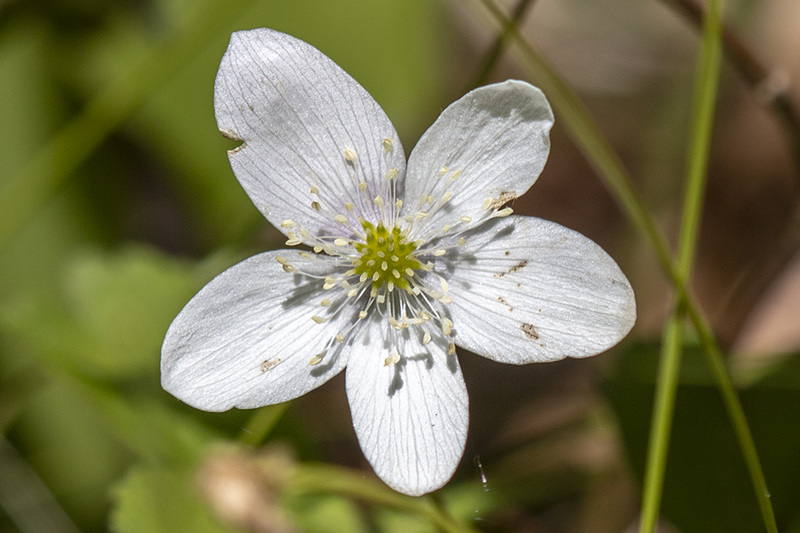 The flower is white to pinkish, 1″ wide, with 4 to 6 (usually 5) petal-like sepals and 30 to 60 stamens. The above-ground portion of this perennial dies back by mid-summer, leaving only the underground rhizome to await the next spring. 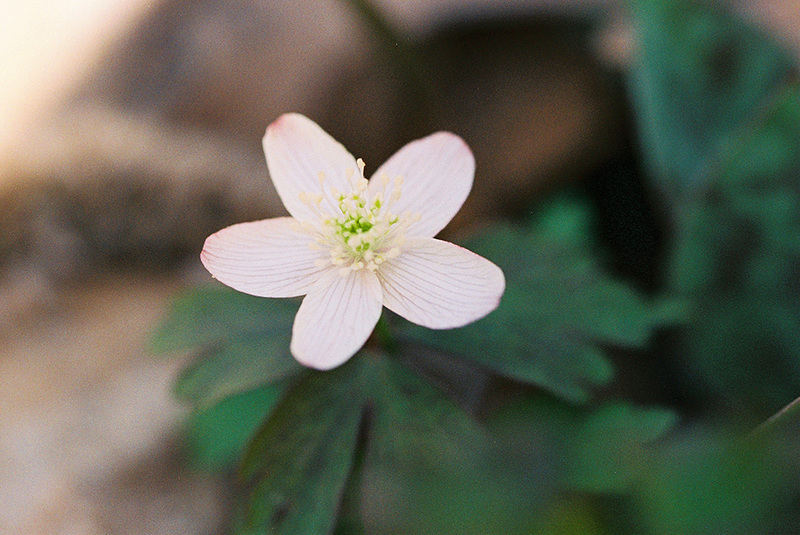 Wood anemone (Anemone quinquefolia var. bifolia), the western variety, has central stems that are covered below the whorl of leaves with soft, spreading, shaggy, unmatted hairs. It does not occur in Minnesota. 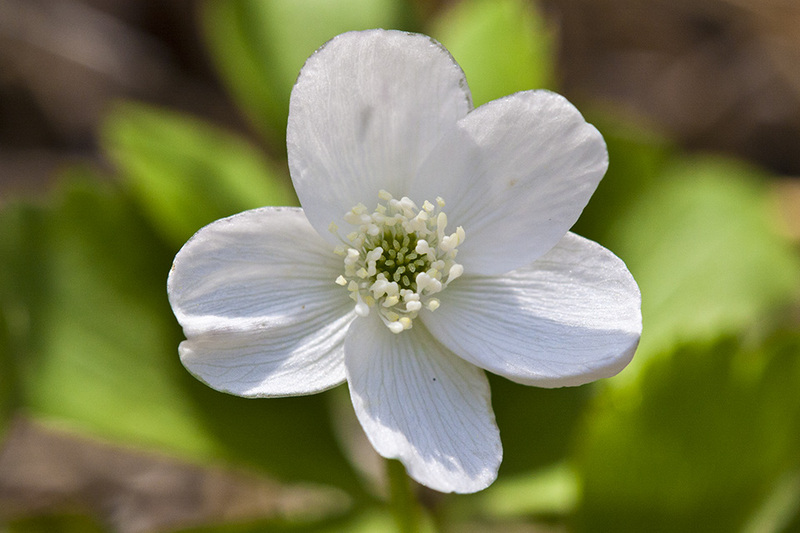 The Wood Anemone is one of the earliest spring flowers. It blooms before surrounding trees begin to grow leaves. 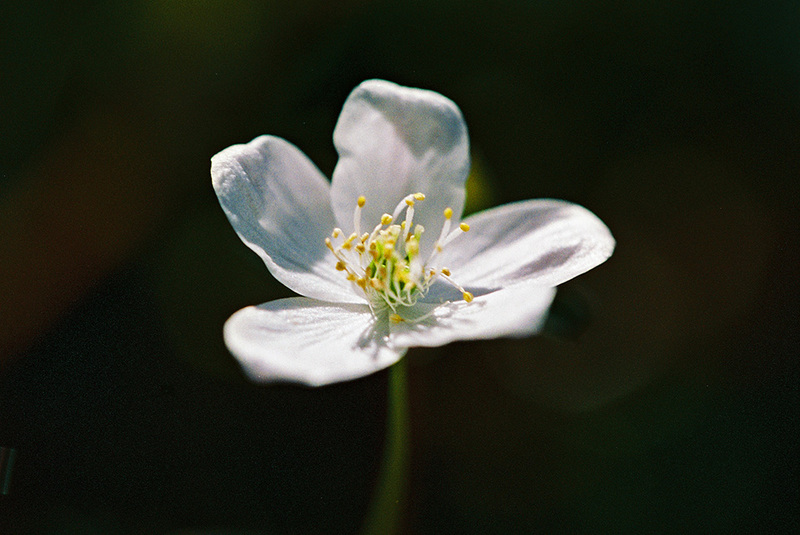 In sunshine, the flower is expanded wide, but at the approach of rain or night it closes and droops its head. De gewone bosanemoon is een tapijtvormer en bloeit met witte bloemen in het vroege voorjaar als er nog geen blad aan de bomen zit. Als de zon sterker wordt, verkleurt het loof snel naar geel en verdwijnt vanzelf. Alle bosanemonen zijn volledig winterhard. Visit WWW.STOCKSHOT.NL for highres version or broadcast video footage. 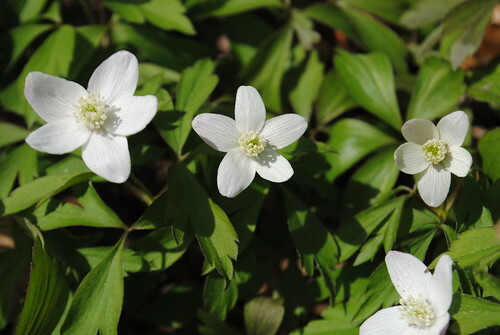 A short clip showing you how to identify Wood Anemone (Anemone nemorosa). Keep an eye on the Species Recovery Trust website (speciesrecoverytrust.org.uk) for new instalments. Location: Haagse Bos, The Hague. The "backyard" of the Dutch queen Beatrix. Al sinds de 19e eeuw bloeien ieder voorjaar stinzenplanten rondom het kasteel Hackfort, langs de Baakse Beek en in het parkbos.